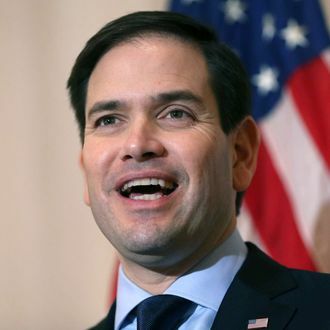 Marco Rubio has called Donald Trump an erratic “con artist” who can’t be trusted with America’s nuclear codes and is “wholly unprepared to be president of the United States.” On Tuesday, Rubio said that he stands by all his stated reservations about his party’s presumptive nominee — but will vote to give the madman access to atomic weapons, nevertheless. But later in the day, the Florida senator — who once sold #NeverTrump bumper stickers from his campaign website — told CNN’s Jake Tapper that he stands by his pledge to support the GOP nominee. Rubio’s tepid endorsement moves him several notches down on Trump’s enemies list. Former Florida governor (and deeply sad presidential candidate) Jeb Bush has said he will not vote for Trump, while Ted Cruz refuses to say what he intends to do in the ballot box this fall. Several other Republican elder statesmen have said they will not be attending the Cleveland convention, including both former presidents Bush and former GOP standard-bearer Mitt Romney. Rubio told Tapper he wasn’t sure whether he would attend, but said that, if he did, it wouldn’t be for Trump’s sake. “It would be primarily because I’ve gone to the last three conventions, I’m an elected Republican at a national level,” Rubio sad. It is only the people that were never asked to be VP that tell the press that they will not take the position.